Zen might be healer per se, but it's his Fast trait and Enlightenment skill that makes him an offense type hero. A hero with normal speed can now attack with a temporary Fast trait. I am quickly dismantling defenses with this "enlightenment" (pun intended). On a normal non-Zen pvp fight, my aoe attacker has to wait a turn. If he gets disabled ie frozen, immune, etc, then maybe 2-3 turns more before he can attack with his special skill. With Zen, the normal hero can attack before all normal heroes so bypassing the disables (of course barring scenarios with fast heroes already like Indigo). Plus this hero can attack again due to the haste bonus. What heroes are you finding him most useful to combine with? Obviously bovus is thought of immediately but I feel I would still typically want torchy as I often rely on bat out of hell to finish off the last person. no one care about new hero, not gona pull it. I don't have medusa/zen and my aria/ember are 1*. In case not read elsewhere or I have missed it, will zen be permenantly in the heroic portal? Zen is just around for this event. We've added an extra line to the event thread to clarify this. 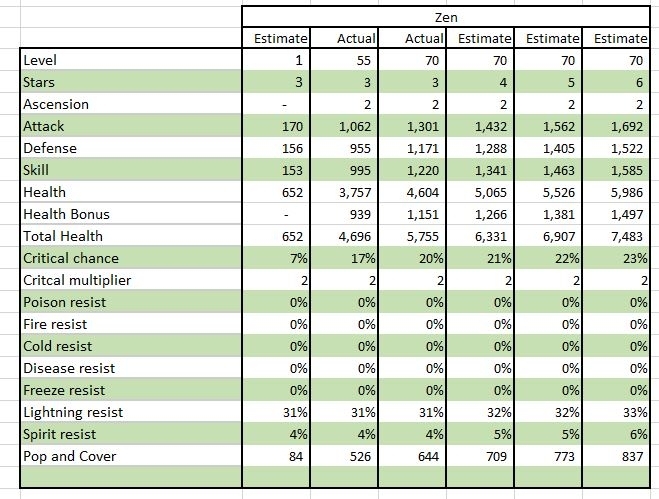 Some estimates of Zen at various star levels. Let me know if anyone has actuals that can compare to see if I'm accurate. Why not calling him Zynga? He's not from Farmville is he? Is he actually fast? I unlocked him but he doesn't have fast trait listed like everyone else that is fast. He is literally tagged "fast flying healer" so yes he is fast. I would imagine they just didn't get the trait put in right or will fix it later. I'm just curious what has it been with these fast casters being created recenty @Joveth can we get the team that makes the heroes to give a bit of info on it? I will always find something to complain about, even as ridiculous as it may sound. My notifications box seems to have stopped working sorry if you get no reply from me. this hero is plain stupid as it caused an unneeded and never requested augustus nerf. New hero releases used to be a celebration of the new hero, complete with a variety of fun and clever quests where you could earn up to 100 tokens of the new hero, not to mention the 100 token jackpot for the PVP winner of the new hero. I don't even see why they wouldn't want to do that because people used to buy crazy amounts of gems going for those tourney wins. Now its.... 20 Ponti tokens. I don't even see why they wouldn't want to do that because people used to buy crazy amounts of gems going for those tourney wins. Now its.... 600 aether / 0.92 Aria tokens. What is your logical explanation why this hero is stupid? @robotowar maybe you wanted me to talk about the fact that every hero without a dual-hit skill stands literally no chance even against a lv1 zen? does this soun ANY fair to you? but yeah, to support this idiotic design, Augustus, one of the most well-rounded and balanced heroes in this game, HE deserved a nerf. 100% reasonable to me. Someone spending real money on this hero is just supporting this crappy gamemaking decisions, and deserves this game to become more and more poor (as it is) while sinking more and more money in it. The whole design of zen and decision to nerf augustus is against game balance, if you ask me. it is against it because a hero that used to buff 55 others got nerfed in favor of one that buffs itself. if you call this balance, we have different ideas on it. so yeah, didn't want to offend anyone in particular, except zen, and wanted to point out that supporting these heroes will inevitably lead to a balance death. But I thought immediately 6 starring heroes was unintended?? Oh that's right, it was only intended to be a lot more expensive, my bad. On topic, this hero continues the trend of making the old ones irrelevant, I guess we can look forward to a lot more of this. There's no such thing as 1 vs 1 in PVP. It's a team (well of course if someone puts a Zen only defender and you blindly send 1 hero to attack). Why are you pitting Zen on 1 vs 1 scenario? How relevant is that use case to the majority of players. Augustus wasn't nerfed. The Aegis stacking is a bug. No, I'm not saying it's a bug because DB said it is. If you already have Aegis activated, why is there a need to activate Aegis again? I know it's convenient but that's not intentional. Should we allow Daze (or any ability) stacking as well? Why does Aegis get the special attention of being able to stack? Whether Augustus was nerfed or not (by your definition) does not make the game balance either. People had been already complaining how imbalance the game is even before Augustus is nerfed. I am able to hit ranks 1-3 with my Augustus in PvP without taking advantage of the stacking bug. I'm able to do the challenge mode without also taking advantage of the stacking bug. So not sure how the nerf makes you weaker. Zen is a game changer whether Augustus was nerfed or not (again by your definition). I still don't see the logic why someone spending real money with Zen is "lesser" than someone who paid real money on other heroes. Just because you don't like it personally does not give you right to call people who bought Zen with real money "lesser". If I will play along with your logic, since I have paid multiple heroes in the past, so I have accumulated enough "better" points and I also paid for Zen and accumulated one "lesser" points. I guess I'm still what you categorized as better lol. (I do find that logic weird). FYI, other abilities stack. ever tried overfreezing a character? yes, it works. overdazing (e.g. yoko + therand)? works as well. how about overshocking? turns out this again is a case. so yeah, JUST LIKE any other status, aegis status modification should stack, heh. 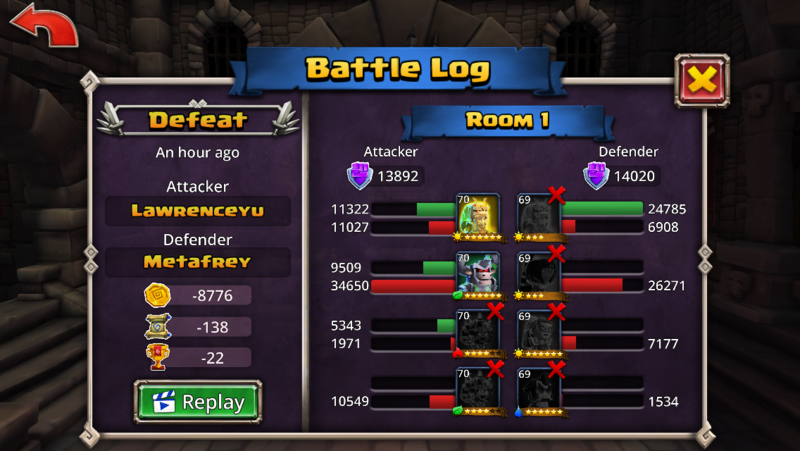 as per pvp, wall stacking is useless and i'm not even sure why you mention it. for pve, it depends. idk your level nor your roster, but definitely beating campaign at a level as low as mine reuires (and deserves) some help. a 15 level gap makes all the difference. to me aegis wall is life saving, to you it might be a good addition. zen is a game changer, and indeed 1vs1 scenarios happen. i had one in tower for myself. would you believe it? augustus vs zen, how freaking ridiculous. a guildie had one in pvp (ponti vs zen, the reincarnation wouldnt retalliate often enough to keep up with zen's heals). but yeah, so it goes right? who cares if the heroes actually able to stand a chance against this are 10 or less, right? you have your puppy and you wanna enjoy it. Zen is way too OP. This game is slowly killing itself. Slow down, devs, and take some time to buff our old friends, make newer events, fix the portals, and nerf Kai and the other OP heroes. That'll get the game going again. Haha gotta love the BD, Masuta, Zen, and Aria combo. Light heroes unite! I think this is a side effect of the mass war chests some early whales accumulated of free summons an gems. 1-2 more heroes and it will be either wallet time to keep it up or we will see a whole new group of folks joining the cause to put some sanity back into the portals. Bring back the original Heroic and VIP portals. New players the chances of getting a hero to 6* after the portal change is nil. If you obtain VIP5 and gain access to the VIP portal maximizing a new hero costs approximately $550. Since Zen's first ability has a healing component, it can't be used on Constructs (Furnace and Alex). Is there a way to make it work on them to get the haste/speed increase and just ignore healing part? @Foozle do we want to make zen more OP than what it currently is? Let the Broken Games begin. What makes Zen broken? I have him at 5 stars and though he is useful in certain niche situations (I find myself most often using him against BD Bovus x x), I hardly feel he is game altering like Kai. I would love to know how I could be better using him to my advantage however!